Renzo Rosso speaks about what he has achieved with Diesel with words from participating acts Sam Sparro, Busy P, The Teenagers and Lindstrom. On Saturday, October 11th, an ambitious musical event will take place with seventeen different parties happening simultaneously in seventeen different countries to celebrate the 30 year anniversary of one of the most daring and distinctive denim labels. The architect of this sheer musical madness is none other than Italian maverick, Renzo Rosso of Diesel. He’s made an entire career out of defying conventions and doing things his own impassioned, witty, idiosyncratic way. From celebrating his 50th birthday with the Diesel Glorious Games to the provocative, sometimes shocking advertising imagery Diesel have used, he has established Diesel as a rebellious force to be reckoned with in the Fashion industry. With Diesel’s premium label, Black Gold becoming a hot ticket at Fashion Week and rumours of Hedi Slimane designing a new line for them, it’s 30th birthday sees the label go from strength to strength, giving all of us plenty of reasons to celebrate alongside him on the night. Dazed Digital spoke exclusively with Rosso and four of the bands playing in London, Tokyo, Paris and Milan. Dazed Digital: Where did you get the idea for this massive global party? 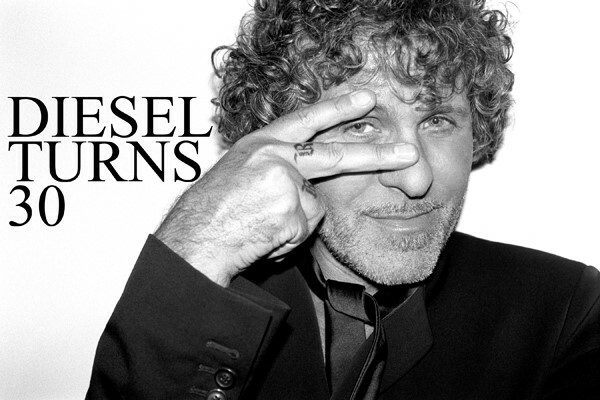 Renzo Rosso: We wanted to celebrate 30 years of creativity and passion and do it in a way only Diesel could do. It’s not about reflecting on our past but looking to the future and using all our talents to come together and create this huge event. There is so much passion and spirit at Diesel, this is a party for the people in the truest sense of the word, anyone can get a ticket. The idea was borne out of sharing this amazing milestone with all the Diesel lovers out there. DD: You have been doing the Diesel:U Music Awards for sometime now. How important is music and supporting new music and artists to you? RR: Diesel is renowned for its support of young and fresh talent, be it in music, film, fashion or art. This year we have taken Diesel U Music a step further by creating a radio station, a voice for new music that can be heard worldwide. It’s about giving people the tools and then seeing them succeed and excel in their creativity. This year we have turned our 30th birthday party in to the ultimate music awards and given raw talent, such as the band Princeton who will be performing at the UK event, a unique platform. DD: Diesel is much more than a brand, it’s more a lifestyle. Would you agree with this? RR: The strength of a brand lies within its capacity to remain true to itself and its beliefs when it is stretched in to new shapes and directions. What began as a pair of jeans is now a car, a wine, a homeware collection, Diesel has always been about leading a successful lifestyle and now we have the products that enable you to lead that life. DD: You said in an interview, “I don’t believe in reincarnation, so for me, paradise is this life.” How do you uphold this philosophy? RR: It’s about finding your own paradise and then being able to share it with those around you. My family are my passion and creating a paradise for them, being able to share what I have built and seeing success. Diesel is not my job, it’s my life. DD: You released a book when you turned forty called ‘Forty’ and then again when you turned ‘Fifty’. What new chapter do you hope to add when you release ‘Sixty’? RR: The joy of living in the moment is the joy of not knowing what could happen tomorrow. I hope that it will be a chapter in a format that does not even exist, that we cannot imagine right now. DD: Tell us a little about your iconic advertising that has on occasion courted controversy. Was the intention behind it to shock or to humour and provoke thought? RR: Our intention was to, and always has been to make people think, to look at the irony of life and to take them on a journey, on that journey there is fun, there is humour, there is craziness and above all there is the possibility that anything can happen! It has been about communicating a message and letting the viewer interpret it in their own way. We are now moving in to a new era of advertising for Diesel, starting with the current campaign, expect the unexpected. DD: You’ve branched into premium denim market with StyleLab and now show at Fashion Week with Diesel Black Gold line. What is the future for designer denim? Can you tell us anything about the rumours that Hedi Slimane is designing a line for you? RR: You never know what’s around the corner! DD: Diesel may be 30 years old but it remains cutting edge and young at heart. How have the youth of today changed over the years? RR: Essentially youth does not change, it remains the same, it has its foundations in hope and every generation of youth has belief and love for the future. The channels through which it flows and the ways in which it communicates may change but at its core it is still about the future. DD: What’s your hope for the next 30 years of Diesel? RR: That’s up to the youth of today!